Leo and I were in Mexico for three weeks in February and March. We stayed one week in Mexico City at our perenial favorite, Hotel Maria Cristina. After dashing around town seeing the sights and visiting with Leo’s relatives, Marta and Pepe, we took off for Oaxaca for two weeks where we found the small and charming, Hotel la Reja with only 6 guest rooms and a cool roof terace where the full moon smiled down at us during our visit. Mexico is a surprising country, partly because it is so old, nearly 10,000 years of human habitation and partly because it is changing so fast. The remnants of the ancient times are still to be seen all over the country as well as the indigenous peoples still speaking in their ancient languages. The skyscrapers you see between the flowering urns have all been built in the last five years. This is a dramatic photo of downtown Mexico City from a terrace in Castillo de Chapultepec in the park called Bosque de Chapultepec which translates from the Nahuatl language meaning grasshopper. One of our first stops is always the famous Café de Tacuba where the classic Mexican dishes are deliciously prepared and gracefully served by an immaculately attired staff of professionals who are warm and welcoming; the elaborate décor is a constant delight. Café de Tacuba is right around the corner from the magnificent Belle Époque opera house which is the chief ornament of Alameda Central, a park of bubbling fountains, specimen trees and beautiful flower gardens. This photo is taken from the café atop the Sears Building across the street at dusk and hence the softened pastel colors. This immense bronze sculpture group by Géza Maróti (1908) crowns the colorful tiled roof of the Bellas Artes Opera House. Here four larger than life-size, or more properly, angel size, female figures hold hands and are draped with an extravagant garland of roses. I assume the roses make reference to the revelation of the Virgin Mary appearing to Juan Diego in a cascade of roses on December 1531 at the hill of Tepeyac, known also as Guadalupe where the famous Basilica is today. On a central plinth we can see the ubiquitous Mexican eagle that marked the place where the Aztecs were told by their gods to rest and settle after long years of exodus. The prophecy of an eagle with a serpent in its mouth resting on a cactus was seen by the migrating Aztecs on an island in a lake in what is now central Mexico and it was there that they built their City, Tenochtitlan. The Spanish destroyed Tenochtitlan and built Mexico City on the site. Usually we see the cactus as it grows naturally in a branching manner. Here the Cactus has been neatly arranged in a globe supporting the eagle with wings fully extended. A cluster of glass and steel towers stand tall at a vital intersection of the Paseo de la Reforma near our hotel. These office towers seem to have sprung up like mushrooms after rain and did not exist the last time we were in Mexico City only five years ago. As you may know there was a devastating earthquake in 1985 that destroyed many of the buildings around the city. This led to a great deal of new development of larger buildings with more sturdy and resilient architecture. The 2009 estimated population for the city proper was approximately 8.84 million people, with a land area of about 573 square miles. According to the most recent estimate agreed upon by federal and state governments, the population of Greater Mexico City in 2016 is 21.2 million people, making it the largest metropolitan area in the western hemisphere and the largest Spanish-speaking city in the world. All is not sweetness and light in Mexico. There is a dark side to the country that has counteracted the rule of law and the Mexican people are vociferous with their protests against these injustices. My personal experience of Mexico is of an orderly and law-abiding country. People here in the USA are forever asking me about the violence in Mexico. Yes there are serious political and criminal problems in the country but overall I feel safe there and have never had any problems over the 45 years that I have been traveling all over the country. 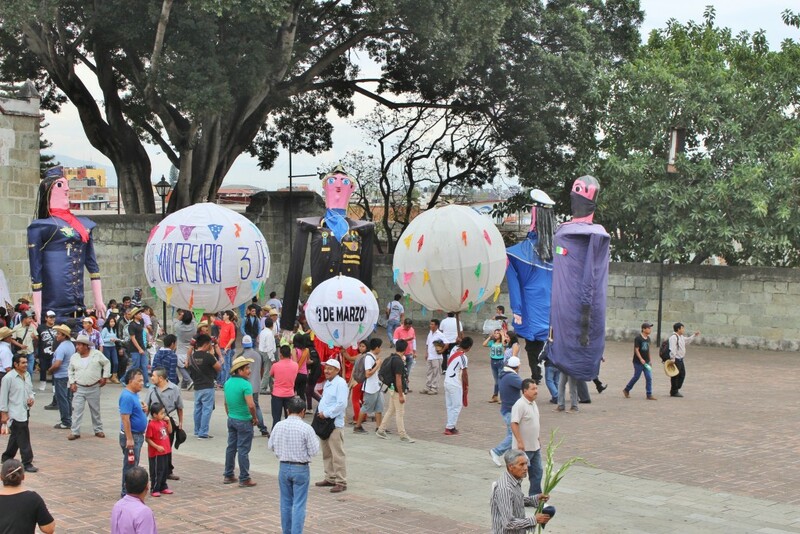 The 2014 Iguala mass kidnapping refers to 43 male students from the Ayotzinapa Rural Teachers’ College who went missing in Iguala, Guerrero, Mexico on September 26, 2014. According to official reports, the students commandeered several buses to travel to Mexico City to commemorate the anniversary of the 1968 Tlatelolco Massacre. During the journey, local police intercepted them and a confrontation ensued. Details of what happened during and after the clash remain unclear, but the official investigation concluded that once the students were in custody, they were handed over to the local Guerreros Unidos (“United Warriors”) crime syndicate and presumably killed. Mexican authorities claimed Iguala’s mayor, José Luis Abarca Velázquez and his wife María de los Ángeles Pineda Villa, masterminded the abduction. This version of the events is strongly challenged and disputed by the family and friends of the 43. As you can see in this photo there is an element of thumbing your nose at danger, threat and violence in Mexico. The culture adopts a taunting bravado of laughing in the face of death that is prevalent throughout their history. Only in Mexico! The combination of powerful spirits hanging out on the street here is mind boggling. This is the entrance to the Museo Nacional de Arte Popular. Do yourself a favor-dash to the Airport buy a ticket to Mexico City. When you get there take a cab directly to Arte Popular! Here is an explosion of creativity that is the true expression of the Mexican Psyche, a power gaining momentum for thousands of years. We flew to Oaxaca and settled in a quiet hotel in the historical district. An arrangement of pedestrian streets in the center city adds to the charm of the place allowing for a party like atmosphere that pervades the bustling state capital. Monument to Benito Juarez, five term President of Mexico from 1858 – 1872. He was a full blooded Zapotecan Indian from Oaxaca. This handsome courtyard is the main entrance of the University of Oaxaca. Churros are, of course, popular pastries that often accompany a cup of Oaxaca chocolate which is served either with or without milk. A friendly Mexican waiter suggested I try my daily morning chocolate with water rather than milk because I would then be able to taste the subtle flavors of the Oaxaca chocolate more clearly. He was right and I followed his lead ever after. I love Sr. Churro in this street sign. He is so ultra-cool steeping in his chocolate bath and the shades really make the Man. This mural on the walls of the staircase at Palacio de Gobierno was painted by Arturo Garcia Bustos and finished in 1980. It is entitled, “Histories, life, customs, Traditions and Festivities of Oaxaca, or ‘Oaxaca in history and myth.’ ” This central panel illustrates independence, reform and revolution with four of the prominent figures of those events at the top of the wall from left to right, Emiliano Zapata, Benito Juarez, Margarita Juarez, Jose Maria Morelos. 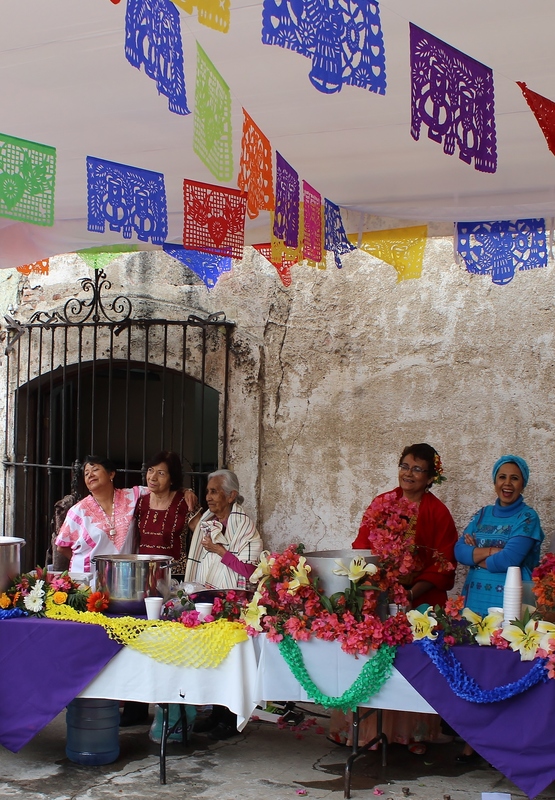 One of the joyful characteristics of Mexican culture is their love of holidays and festivals. In Mexico there are tons of “special” days. On top of a love of parties I guess you could say that the Mexican spirit is full of gratitude for whatever they do have and delight in acknowledging the great feast of life. While we were in Oaxaca there was the festival of the waters or Festival de Aguas de Frutas. The festival celebrates Dia de la Samaritana or Good Samaritan’s Day. In Oaxaca this is a special day within the Lenten period when free ‘aguas’ are handed out on the main walking streets. Mexican ‘aguas’, literally translated as ‘waters’ are very refreshing natural fruit flavored drinks. Aguas are usually made in homes or at site where they are sold. There are many kinds but popular ones are ‘Agua de Jamaica’ (hibiscus), ‘Agua de Tamarindo’ made from the tangy fruit pods of the tamarind tree and ‘Agua de Horchata’, a rice based water, tasting like a liquidy rice pudding). 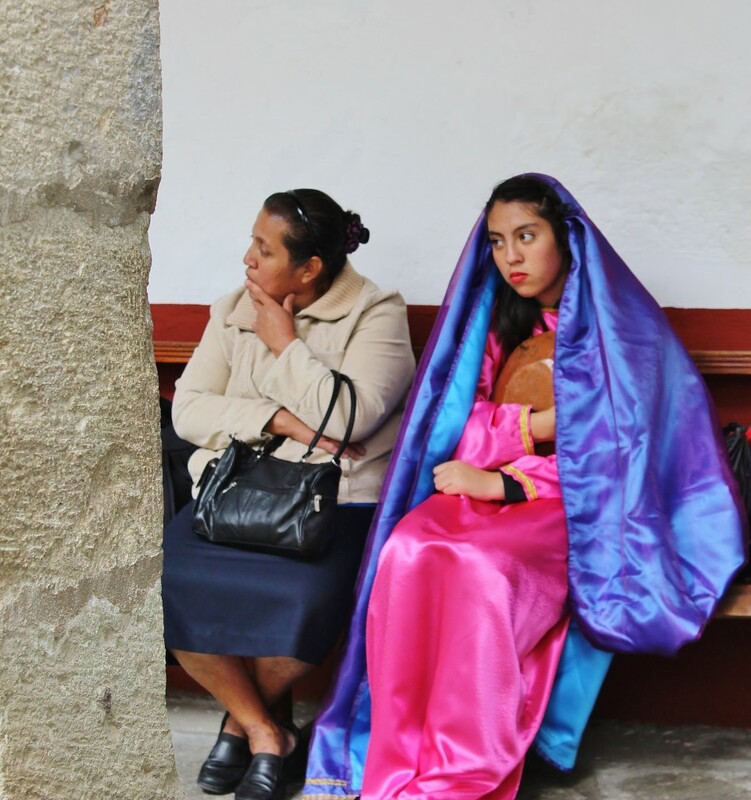 The fourth Friday of Lent in Oaxaca is observed by enacting a pageant recreating a passage in the bible where a Samaritan woman by the name of Photine gave a thirsty Jesus a drink of water at a well (John 4). Inside the cloister of the old church where the “Agua Samaritana” ladies were giving out their delicious drinks, I came across a group of teenagers dressed in the costumes of biblical times awaiting their turn to enact the moment of nurturing care when the Samaritan lady gave Jesus a drink of water. The beautiful young woman here (La Photine herself I assume) and her chaperone seem a little tentative as Photine awaits here cue to perform in the pageant. Here is a conference of ancient figures gathering at the Museo de Arte Prehispanico de Mexico Rufino Tamayo. Sr. Tamayo was one of the great Mexican painters of the Twentieth century working in Mexico City, New York City and Paris. He was of Zapotec heritage and a native of Oaxaca. 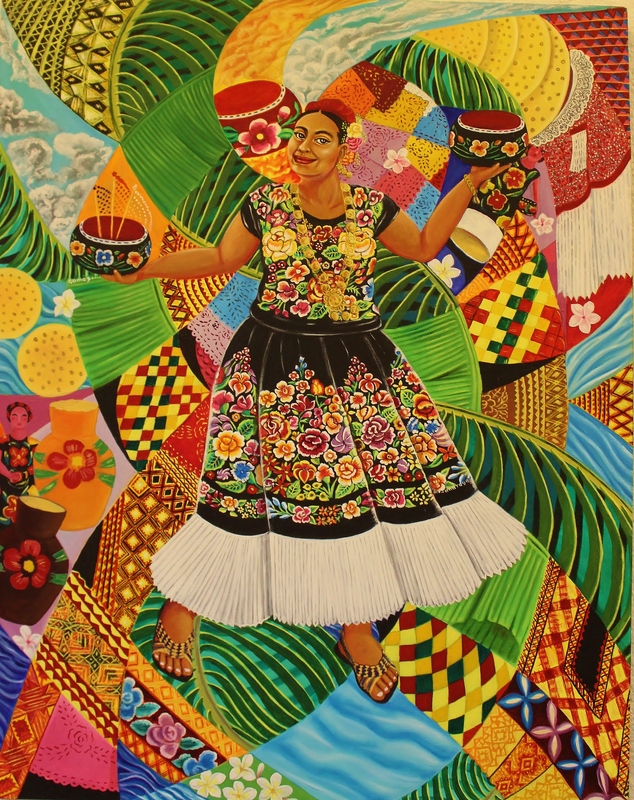 By donating his collection to Oaxaca, Sr. Tamayo intended to preserve the ancient culture of Mexico and keep it in Mexico. 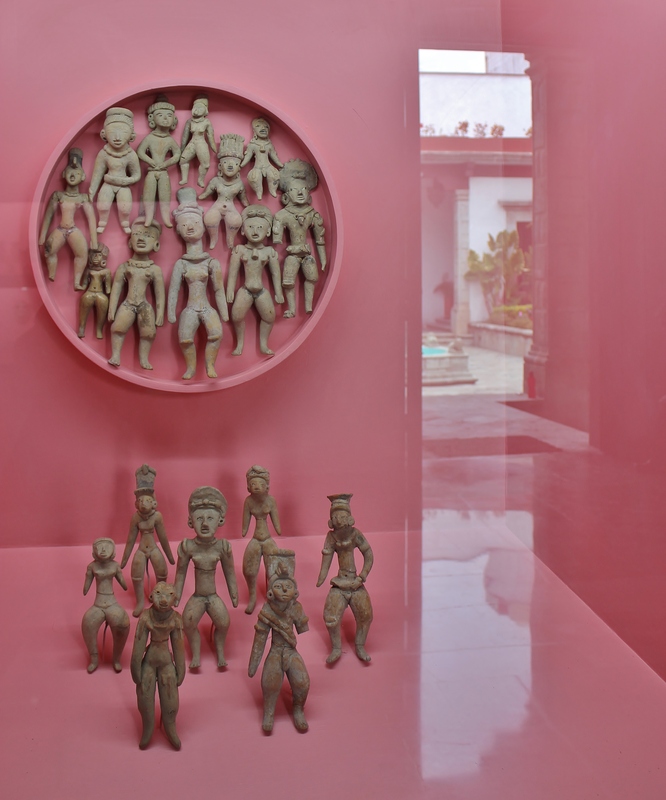 Tamayo and his wife collected and displayed their artifacts in a restored seventeenth century building in the historic center of Oaxaca City. The museum has a charming central courtyard/garden, a corner of which can be glimpsed as a reflection in the glass of the display case. 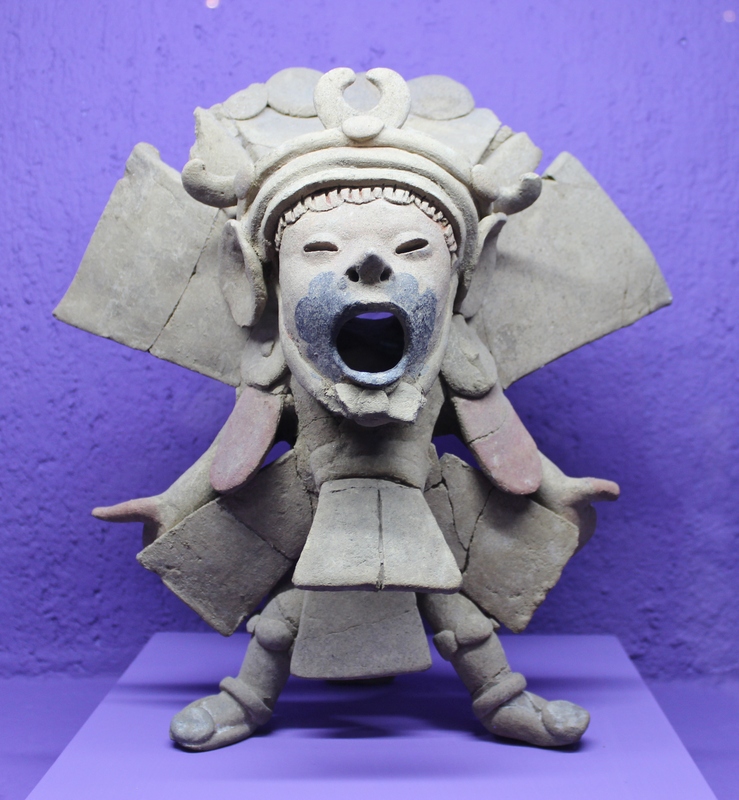 The Rufino museum has enjoyed a complete renovation of the interior and cheery bright Mexican colors have been used as backgrounds in all the display cases. How could I resist showing you this little darling singing an ancient song? His tattooed mouth has a handsome shape making a visual megaphone that adds a few decibels to his phantom voice. If you are quiet you can hear the echo of ancient times. Now here we go, another parade/festival in Oaxaca, this time the celebration of the formation of the municipal workers union of Oaxaca City. All the “giants” and balloons are homemade of paper and fabric stretched on light wooden frames. Now here is a happy ending. This scintillating painting is by Oaxaca painter, Joaquin Gomez. I saw it in an exhibit at the Palacio de Gobierno (city hall) where I also saw the history murals featured above. This festive lady is balancing a pair of painted gourds of the type that I collect. She is dressed in the traditional costume called La China Poblana, supposedly being inspired by a Chinese lady of the viceregal period whose attire was greatly admired and copied by the Mexicans. I love the rich use of colorful patterns that spiral about her illustrating the interconnectedness of all things. This entry was posted in Mexico 2016, World Travel on June 29, 2016 by ioryallison3.